We all want more space in our lives. This could be more space in your car, more space in your bag or even more storage space for your data. When it comes to data, Seagate has got your back with the Backup Plus Ultra Slim hard drive. The hard disk is available in 1TB or 2TB variants, so you can pick one based on your needs. The hard drive work with both Windows and Macs, so you do not have to worry about compatibility. In fact, the Paragon software allows for smooth compatibility between the two operating systems. However, one of the most interesting aspects of the Seagate Backup Plus Ultra Slim hard drive is its design. The device is features a honeycomb-like design and is available in two colour variants, Platinum and Gold. But that’s not all. The entire hard drive is just 9mm thick, so you shouldn't have too much of a problem carrying it around. Large storage capacity and an intelligent design isn’t the only thing that the Seagate Backup Plus Ultra Slim hard drive has to offer. The drive comes with a software set called toolkit. This toolkit comes with a feature called Mirror. This creates a two folders, one in the hard disk, and one on the desktop. Whenever you add, edit or delete something in one folder, Toolkit automatically does the same to the other. One of the things and everyone fears is their hard drive crashing, resulting in the loss of valuable data. With the Seagate Backup Plus Ultra Slim hard drive, you can have some peace of mind. The drive comes with 2 years of free recovery through a service called Rescue. As if that wasn’t enough, the Seagate Backup Plus Ultra Slim hard drive also offers buyers a two month subscription to Adobe Creative Cloud Photography. 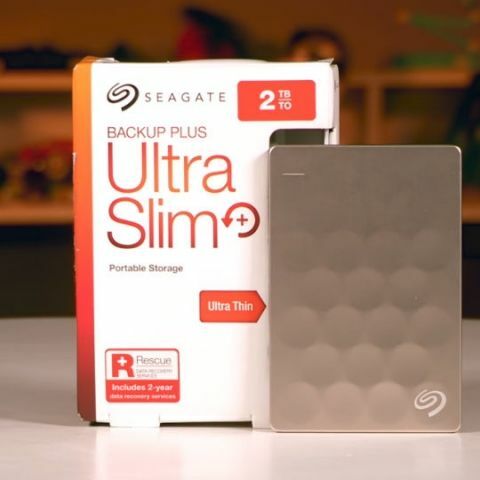 Here’s a video that details everything that the Seagate Backup Plus Ultra Slim hard drive has to offer.